Extension Directors and Administrators from the five regions of the Cooperative Extension Section participated in Next Generation Extension – Learning for Leaders’, A Leader’s Guide to Natural Disasters. Nick Place, University of Florida Dean and Director of Extension and ECOP’s Liaison to the Extension Disaster Education Network (EDEN) Executive Committee, guided the conversation. Follow this link to watch the recording. Follow this link to access the presentation. When the Centers for Medicare & Medicaid Services tasked their Quality Innovation Networks with improving diabetes self-management outcomes in underserved Medicare populations, they used a measurement called the Area Deprivation Index (ADI) to determine where those interventions would take place. Intermountain Health based in Salt Lake City, Utah used the ADI to assist in getting a better view of their communities and service areas. The data visualizations they created to identify areas of deprivation were developed by region and shared with community stakeholders to identify and develop implementation plans to address needs in more deprived areas. Follow this link to access the data tools. The National Urban Extension Conference on “Innovation in the City: A Land Grant University Experience,” provides opportunities for Extension professionals from all program areas to learn about research and innovative educational strategies that address the needs of urban, suburban, and peri-urban populations as well as urban-rural interdependencies. 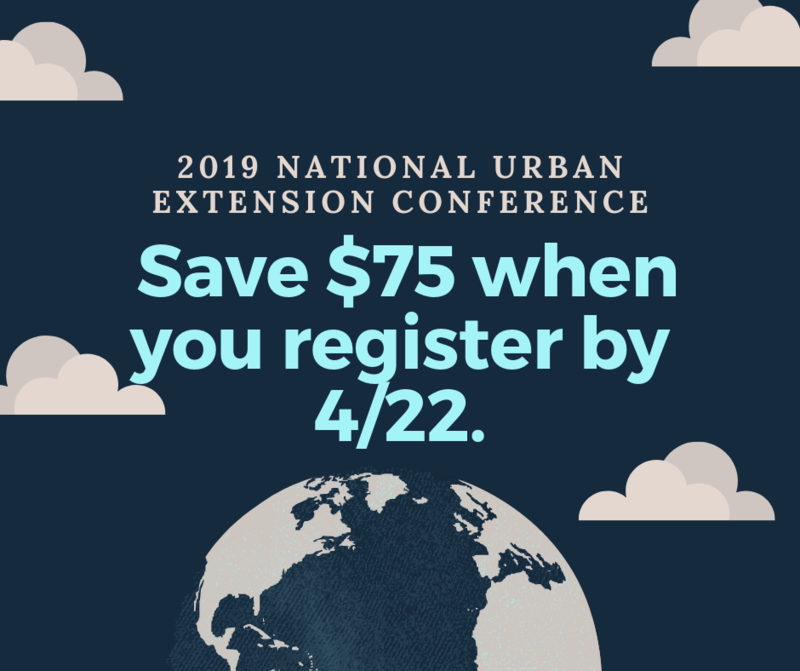 If you register by April 22, you save $75. 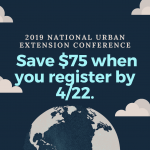 Follow this link for all the conference details. City leaders interested in getting more young people outdoors and connected to nature can now apply to the 2019 Cities Connecting Children to Nature Leadership Academy in Denver. The Leadership Academy is a fully subsidized two-day convening (June 12-14) aimed at helping cities develop strategies and initiatives for more equitable connections to nature for children. These efforts can help city leaders leverage existing city goals and mandates related to health and wellness, parks and green space access, education, out-of-school time, resilience, and equity, among others. Selected city teams will explore successful efforts to improve access to nature in cities across the country, with a focus on children from communities with historic or recent lack of access. More than 650 individuals participated in the Franklin County 4-H Clover 5K and Walk & Serve on April 6, 2019. This year, many of the 4-H youth demonstrated a new level of ownership in the planning, preparing, and presentation of the service projects that benefitted 19 non-profit organizations. They share first-hand stories about the organization’s mission while participants work on needed items for the clientele of the organization. Each non-profit finds the Walk & Serve a great place to bring awareness to their need, but also remark how important it is to keep fanning the flame of “serving” in all ages. More than 2,100 service projects were donated to various charities in one day. 4-H clubs from every part of the county dedicated a portion of their day to making this event successful. Follow this link for more information. Is the Rise of Older Americans in the Workforce Necessary for Future Growth? The working behavior and participation rates of older workers in the labor force have shifted substantially in recent decades. Although much of the 3.1 percentage point decline in U.S. labor force participation from 2007 to 2018 can be connected to an increased aging population (the share of the U.S. population over the age of 65 has increased from 15.6 to 19.9 percent in the last 12 years), the explanation for this trend extends far beyond a population aging out of the workforce. Follow this link to read more. It is now clear that the world is not on track to achieve the Sustainable Development Goals (SDGs) by 2030. While there is progress on some fronts, such as poverty, it is nowhere near fast enough to accomplish the vision of sustainable development. On several indicators, including stunting in young children, there is little discernible progress over time. Millions are being left behind. This is particularly true in rural areas that are at risk of being forgotten because the focus of policymakers is shifting toward urban areas, where slums, unemployment, and congestion threaten national progress. Follow this link to read more. As a result of a great discussion at the recent Master Gardeners Volunteer State Advisory Committee, they have decided to revamp their Grow Ohio program while still providing counties with an incentive to address the food insecurity issue. All counties with any type of food insecurity, community garden, gleaning, and other projects that meet the impact area of Sustainable Food Systems are eligible. Follow this link to learn more about the mini-grant program and to access the application. CFAES provides research and related educational programs to clientele on a nondiscriminatory basis. For more information, visit cfaesdiversity.osu.edu. For an accessible format of this information, visit cfaes.osu.edu/accessibility.